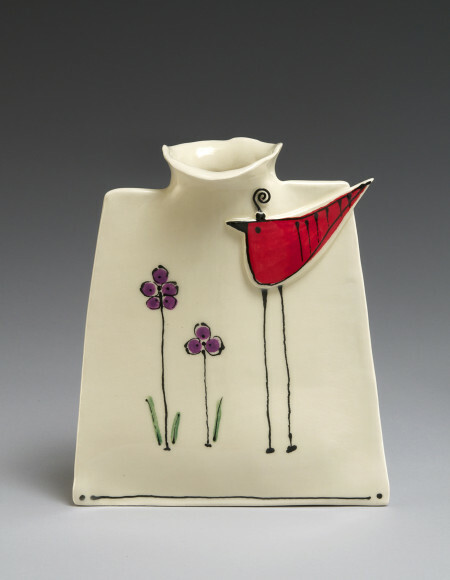 Cheryl Kempner’s focus at AAW featured show is on hand-built, brightly colored clay pieces entitled “Clay Birds, Birdhouses, and Blossoms.” These birds can sit on a windowsill, can stand on tall metal legs, can hold a tea pot, books, coffee cups, and more. Images of these primary colored birds also appear on plates, vases, and cups. These whimsical birds also find their way into Cheryl’s metal garden art pieces. 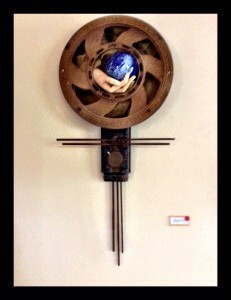 “Air and Fire” by Elin Babcock includes Assemblage Sculptures and Lyrical Abstract paintings. Elin Babcock’s assemblage sculpture joins found objects that have lost their way; wood with rusted metal; wire with glass; common objects and delicate feathers mixed with re-bar.